I haven’t written a blog for a while due to being busy on the work front (yes, like 88% of aspiring authors, I work a day job that lets me save a bit on the side for producing my running novels) and also because I’ve been writing in my spare time. Asked recently why I write my stories after the fact, which I thought was a great question, my answer was for better authenticity. My upcoming third novel Go Gayle Go is set between 2014 and 2016. I wrote it over the summer of 2015/16 before the Rio Olympics, then made modifications after the Rio Olympics. In my first draft, I had a key rival of Gayle’s being Russian, but banished her for someone not from Russia due to the whole situation that unfolded in early 2016 that factually changed what I had. On the other side of the coin, I’ve done the same with my next novel I’m writing, which also has some of that story set at the Rio Olympics. When I started drafting the story, I didn’t mention the Zika virus that swept Brazil in the run-up to the games. It’s why I won’t skip on to set my stories in Tokyo, for example, before the 2020 Olympics are actually held. Just like I’m glad I never set a story in the future at the Durban 2022 Commonwealth’s, but I can reveal that in a future novel, Kelly and co. will be at the London World Athletics Championships later this year. I’ll write that story from my own first-hand accounts from being in attendance. The looming backdrop for that story are the current tragedies this summer that have hit the UK. It’s been a bad year. Had I jumped on ahead, those background events would have been missing. I’ve definitely been swayed off predictive writing thanks to two of the three other running novels I’ve read, falling into this trap. Peter Lear’s Golden Girl, about a genetically modified American sprinter who wins the 100,200 and 400m treble at the 1980 Moscow Olympics is a terrible example of writing in the future, given America boycotted those games and never went. Subsequently, Golden Girl has aged rather badly, I feel. As a teen, of course I was going to read Golden Girl! In the Golden Girl movie, Anton is no Wonder Woman. acting. 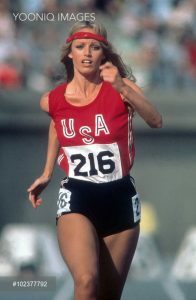 Susan Anton, on the other hand as Goldine has a great smile and is obviously very much the all-American girl; she’s great in that regard, but as a runner she just doesn’t look like one to me, so isn’t convincing. It’s a heck of thing to pull off, hence why running movies are so hard to do. The other running story I’ve read most recently is Over the Line. It isn’t anywhere as bad as Golden Girl for predictive storytelling. All the author did there was make mention there were Russian’s in Rio. 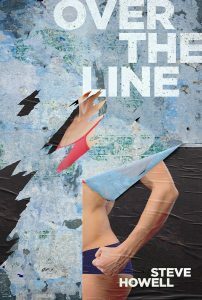 Incidentally, I recommend Over the Line as a really good running novel to read. 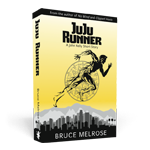 In fact, it’s really more a crime novel set firmly in the world of track and field. I got a Kindle version and I have to say, while possibly the worst formatted e-book I have, once you ignore that and just read the story, all is forgiven. Have a read. It’s a good story. Over the Line would make a great BBC/ITV/BSKYB two-part mini-series that the Brits do so well. I’m sure author Steve Howell had that in the back of his mind when writing his novel. Maybe I ought to think more like him.